Update: Vino di Pino had to close around mid July 2011. Apparently a disagreement with the landlord forced him to leave the location on Haarlemmermeerstraat. Pino is currently looking for a new location where he can reopen shop. 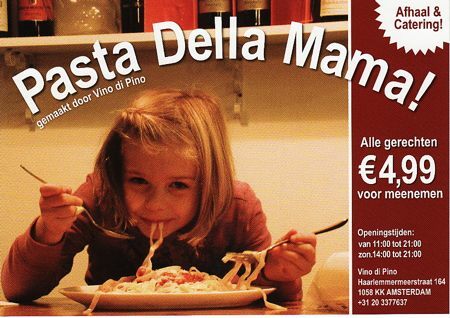 The area around Hoofddorpplein has a great new Italian take away option. Italian wine store Vino di Pino started offering pasta dishes a few weeks ago and has been cooking up a storm since then! The pasta is prepared fresh in the kitchen of the store and very good. It started out with a daily dish and has grown into a full-fledged menu with several starters, pasta dishes and desserts. The menu changes with daily specials and classics like lasagna, parmigiana alle melanzane or penne all’arrabbiata. There were some great truffle specials and recently also main courses like osso buco. The food is very good and a great deal at € 5,= per portion. What’s really special is the warm and friendly atmosphere that owner Pino creates. He welcomes all regulars and new visitors with a big smile and a fun story. After explaining the menu and specials of the day, Pino quickly moves the conversation to other topics, taking a personal interest in his customers, talking about recent developments in the neighborhood or showing videos of the latest local food and wine events that Pino is organizing with some of the other cafe and shop owners on Hoofddorpplein. While chatting, Pino loves to break out a bottle of wine from the store and offer a taste to shorten the wait for the take away food. I’ve been a frequent visitor recently, enjoying great take away pasta at an attractive price and catching up with Pino and other neighbors over a glass of wine. As an additional benefit you can purchase the wine at 50% off for the second bottle. Ha! when the weather was so bad the past weeks, I took the bus instead of the bike, and waited at the bus stop opposite Pino every day, and saw the sign about the pasta, and always wondered about it. (But never bothered to go in and find out more) so thanks for doing the field work! Will try it out soon! Warning: One of the two walked out with several bottles of nice wine, too. He got a great package deal! He did not have a problem with his landlord, he simply did not pay the rent and bills. Has a good Italien he is now ripping your own belasting and uitkerring. Eh this is Europe..no! Anyhow if you like that food and wine you should get a life and go where actually good food and wine are. Overpriced wine and frankly did not find any valuable bottle to buy. Oh yeah you must be Dutch and have no taste nor style. Well I got it. No offence! Your comment sounds quite bitter. Were you involved in the termination of the store? I got my info from Pino and could neither verify nor identify it as false, which is why I reported it as “apparently”. Would love to know if you have additional details. Would be great if you could then also disclose your relationship. Maybe LKA’s comment should be taken off this blog for his/her sake and the, very good, blogs sake. For his/her sake because he/she shows his/her lack of intelligence by trying to insult first all Italians, then all Dutch and then the whole of Europe. Souds too pityful and I can imagine he/she regrets this display of frustration and unintelligence. For the blogs sake, because the blog is about food.